The Blue Tigresses won the game by 3-1 in a hard-fought contest. 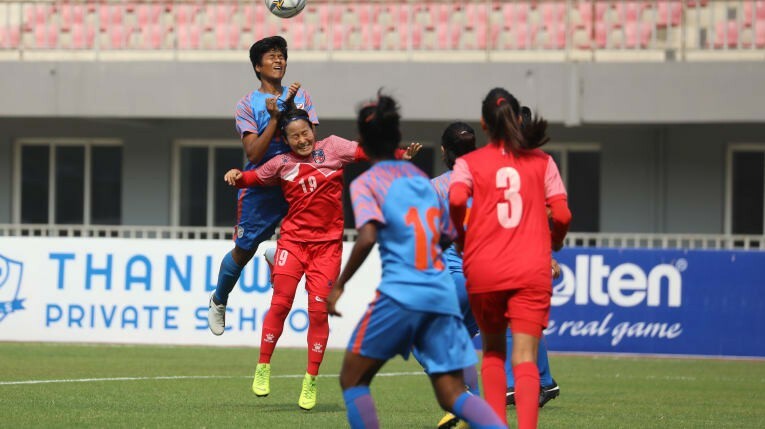 Mandalay: The India women’s national team defeated Nepal 3-1 in the second match of the round two of the Olympic Qualifiers at the Mandalarthiri Stadium jere on Saturday. India now has six points from two matches, with host Myanmar at the top of the table with the same number of points but a better goal difference. A Punam Magar own goal gave India the lead in the sixth minute, but it was cancelled out by Niru Thapa’s strike in the seventh minute. However, Sandhiya Ranganathan’s header in the 60th minute and skipper Ashalata Devi’s 78th-minute penalty led India to a hard-fought and a crucial win. With Grace and Sanju on the wings, creating problems for the opposition defence, the first few minutes of the match played out in India’s favour. India drew the first blood in the seventh minute when Nepal’s Punam Magar slid the ball into her own net in attempt to clear a cross from Sanju. However the joy was short-lived as the Indian defenders were caught off-guard in the next minute and Niru Thapa equalized within moments of India getting the lead, tapping home from inside the box to level the scoreline. Sanju hit the post from inside the box in the ninth minute as the Indian women looked to regain their lost lead. Ratanbala Devi had a golden chance to give India the lead again in the 25th minute but her header off a Sanju cross went inches wide of goal. While it was an end-to-end action in the early minutes of the match, the game then evolved into a battle for possession in the midfield with the Indian midfielders dominating and the opponents relying on counter-attacks. In the 58 minute, Dalima Chhibber attempt to slyly tuck a curling shot into the corner of the net from inside the box but her attempt which inches wide of the goal as Nepal survived another Indian attack. A minute later, Ratanbala was found inside the box by Grace’s low cross but her attempt resulted in a weak shot that was swept out. However from the resulting corner, Sandhiya headed home from close range to put India back in the lead. Nepal tried to commit bodies in attack and look for a way to equalize. Attempts by Sabitra Bhandari and Dipa Rai went inches away from the Indian post. Some resolute defending in the latter stage of the match by the centre back pairing of Sweety and skipper Ashalata Devi, saw the match out for India and the skipper got on the scoresheet, converting a penalty in the 78th minute to double India’s lead as the full-time scoreline read 3-1. India will now have to defeat hosts Myanmar on 9th April in order to qualify to the next round.